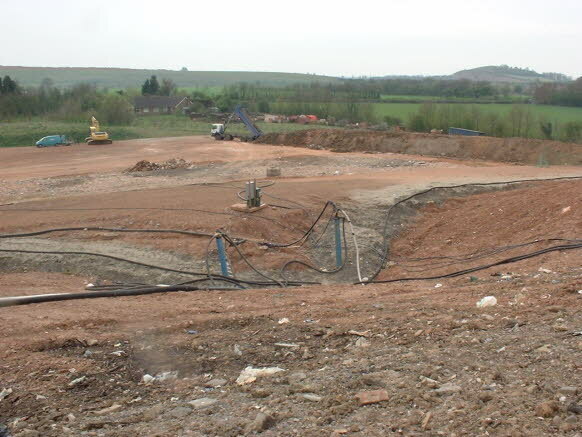 When this photograph was taken the landfill operator was capping the site with a plastic membrane, above which was placed clay subsoil and topsoil-like material. It will soon be seeded and grassed and will then form a natural looking feature in the landscape. The cap will seal the top of the site, and that will minimise the volume of leachate generated. However, some will continue to collect at the base and will still need to be removed. So the wells in the foreground have been installed to remove the remaining leachate and gas generated. All the pipes seen in this picture will soon be buried, and grassed over.